Most portable mp3 players such as iPods come with a pair of ear buds. These are used by sticking them in your ear canal. The speakers aim the sound directly into your ears. This isn’t a useful setup for cochlear implant users. It will, however, increase our ranks in the decades to come, as people listen to music at loud volumes for long periods of time. Some users with T-mics have found a way to position the ear bud so that the speaker faces outwards, directly towards the T-mic. The sound does get to the T-mic, but the T-mic can also pick up lots of environmental sound. And since the speakers are facing outwards, the sound may bother others nearby. Most earbud and headphone arrangements, even for users with normal hearing, deliver the sound to the listener while blocking external sounds to some extent. You can modify earbuds so that they can be gently pressed onto your T-mics. This method blocks environmental noise to a large extent, and directs the sound to the T-mics. The good news about headphones is that you can generally use them in a normal manner. If you have two implants, just put a pair of headphones on! If you have one implant, you can still wear headphones, but of course you will only hear the sound on your implant side. If you have one implant and one hearing aid, putting the headphones on top of your hearing aid may cause feedback, or whistling. Pay attention to the location of the mike on your processor. Most BTE processors have one or two mikes at the top of the ear. Smaller on-ear headphones may not deliver the sound directly to the mikes. You may be able to perch the headphones high up, so that they are aimed at your microphones. Usually this will mean that the band that goes across the top of your head will no longer be able to help hold the headphones in place. If you have T-mics, just use the headphones normally. Larger over-the-ear headphones may work better for processors without T-mics. These headphones have a cup that surrounds the ear. If the cup is large enough, the processor mike will be enclosed. Noise-cancelling headphones work well with cochlear implants. Of course you don’t get any feedback the way that you do with hearing aids. Several noise-cancelling headphones are large, over-the-ear type, so you can use them whether you have a T-mic or conventionally located microphones. Noise-cancelling headphones block out external noise to a surprising extent. You may consider them as filling a gap between normal headphones and direct connect. The best part is that you can buy the same headphones that people with normal hearing use. While they may cost more than regular headphones, they are much less expensive than most specialized assistive listening devices. And it is empowering to walk into a store or place an order on line for a standard piece of electronics. If your microphones are at the top of your processor, and the cup of the headphone seems to block the mike, try using the headphones with your processor set to telecoil. Most cochlear implant processors have the ability to connect directly to an audio source. Usually this involves some adapter that comes with your processor. Check your user guide for more information. Direct connect bypasses converting the electronic signal to sound and then back to an electronic signal. It is the gold standard for audio quality, but it comes at the expense of messing around with cables and adapters. The adapters for direct connect likely end up with a 3.5mm mono socket for an audio cable. This is the same size as the connector on most modern headphones. You need a cable that plugs into this socket on one end, and into your portable device on the other end. The connector on your processor is mono. The cable that plugs into it, which may have been included in your processor kit, should have one band separating two metal connectors. This is what a mono connector looks like. Most audio cables are stereo, which you don’t want to use for this application. Notice that there is only one black band separating two metal parts of the plug. This is a stereo connector. There are two black bands separating three metal regions of the plug. It is the most common type of connector that you will find in electronics stores, but it is not what you want to use. If you have two implants, the challenge is to separate the right and left channels of the player into two separate signals. This splitter, or Y adapter, does exactly that. Each of the mono sockets may be connected to your processor using a mono cable. The red socket is the right channel, and the black socket is the left channel. You will be listening in true stereo! Be careful about buying a splitter that looks like this. Most of them provide two stereo outputs. They are intended to allow two people to listen to one player, each with a pair of stereo headphones. If you use one of these, both of your ears will get only the left channel. If you are only connecting to one processor or if you use the above splitter to make L and R mono channels, you can use either a mono or stereo cable to complete the connection. While long cables are easy to find, sometimes you want the shortest one possible, particularly if the device will be located right next to the processor. 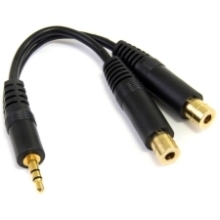 You can use this very inexpensive cable, or this one with right-angle gold-plated plugs.